The page orientation in a presentation slide is the way in which the rectangular slide is oriented for normal viewing while presenting. The two most common types of orientation are portrait and landscape and these are the two formats available in Microsoft PowerPoint. In PowerPoint it is very easy to change the page orientation from landscape to portrait or viceversa. Here we will show you how to change the slide orientation so you can use a portrait layout format instead of the default landscape style. 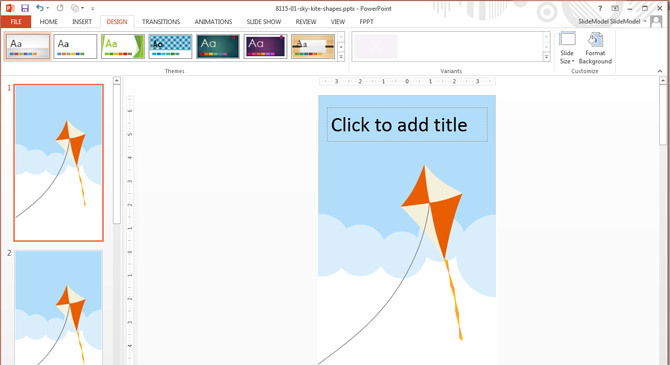 You can change the slide orientation in Microsoft PowerPoint 2013. Follow these steps in order to change the landscape orientation to portrait orientation in Microsoft PowerPoint 2013. 1. Open the PowerPoint presentation and then click on the Design tab at the top menu. 2. Then click Slide Size menu button located at the right side of the toolbar. 3. Click Custom Slide Size… option to open the Slide Size dialog box. Here you can choose the Slide Size properties. You can select a preset, i.e. if you want to change from the Normal layout size (On-screen Show 4:3) to Widescreen (16:9) presentation layouts, width and height. You can also change the value to number slides from, as well as orientation options either for Slides as well as Notes, Handouts & Outline. 4. In order to change the slide orientation from landscape to portrait check the radio button Portrait. 5. A new dialog box will appear, this time asking what to do while scaling to a new slide size. Here you can choose to maximize the visible area or Ensure Fit to scale it down and ensure the new design will fit on the new slide format. Maximize: This option let you take advantage of the entire slide dimension to cover the slide with the current content. Ensure Fit: This option will scale the current content down to ensure it will fit on the new slide. Depending on your design, by choosing this option you may find two empty bars at top or bottom of the slide as display in the thumbnail examples shown below. Finally, here we can see the new orientation applied to the PowerPoint presentation. The following screenshot shows our Kite PowerPoint template adjusted to a portrait format and ready to be used for eye-catching flyer designs. 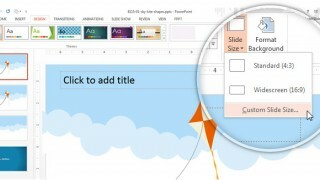 In Microsoft PowerPoint 2010 you can also change the slide orientation. This option is located in the Design menu under Page Setup section as shown in the screenshot below. 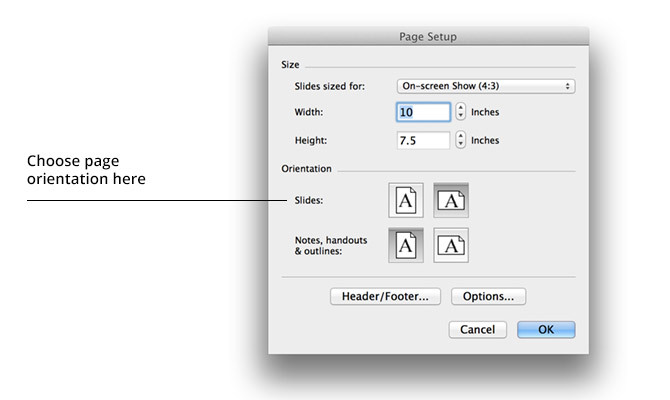 If you are using Mac instead of Windows, then you can also change the slide orientation in Microsoft PowerPoint 2011. In this case, the Page Setup option is located under Themes menu. 1. Go to Themes menu and click in the Slide Size button. 3. Now choose the new slide orientation as shown in the following screenshot. 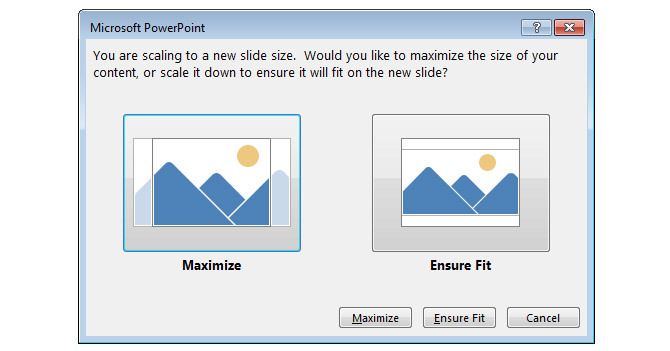 By using a different slide orientation format in PowerPoint you can control how the slide will be displayed either while presenting or while designing a PowerPoint presentation that you plan to print later. For example, this can be very useful if you want to design a flyer, a poster for an University or even a restaurant menu from Microsoft PowerPoint.